When you are outside the fat rights movement, it is hard to comprehend how a person who stops striving for thinness can actually love their own body. The social construction of the fat body tells us that those bodies are inherently bad bodies, and because we chose to live in them the only thing this can mean is that we do not love our bodies. I would argue that a person who is in this movement actually loves their body in a deeper way than someone that buys into the idea that fat bodies are bad. The amount of self-hatred and shame attached to believing that there is something fundamentally wrong with your body and the resulting issues from that kind of thinking can lead to a deep seeded and long history of mental or behavioral issues. When you take away the need to change your body to conform to society, what you are left with is the ability to act because it is good for your body. You eat because it nourishes your body; you exercise because it makes you feel good. Food no longer holds moral value over you, so you don’t feel guilty eating food that would otherwise be deemed bad. You listen to your body, no longer ignoring it if something doesn’t feel right and you learn to live in your body more fully. I love my body every year that I fight back against the standards which dictate that my body is inherently bad, I love my body every month that I eat foods without fear of the choices I make, I love my body every week I make time to find joy in movement, I love my body every day that I look in the mirror and only love what is reflected at me, and I love my body every second that I don’t allow my mind to be filled with hatred and shame. Everyone loves their body and life in their own way, and deciding how much a person loves their own body ignores the fact that no one can ever know what it is truly like to live in their shoes. Celebrate today, International No Diet Day, by loving your body and honoring all of the strong people who have overcome body shame and self hatred. 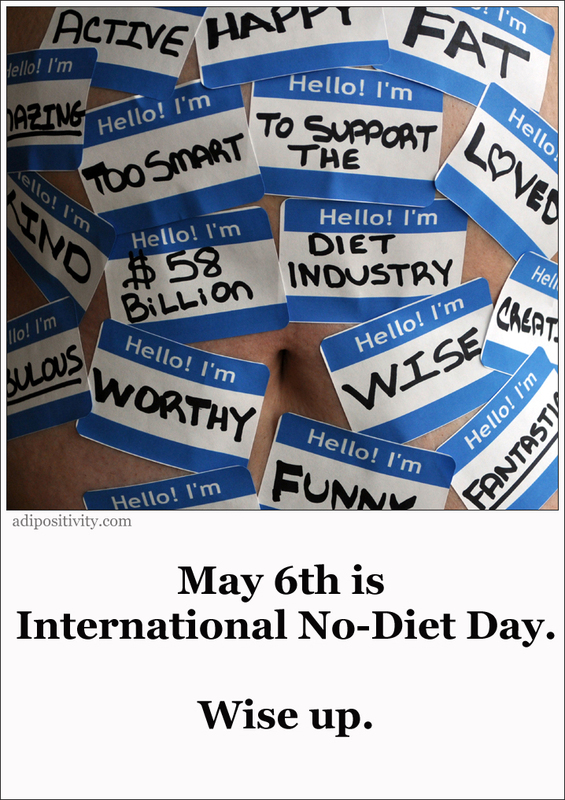 * That I will not diet for one day, on May 6, International No Diet Day (INDD). * And I will try to do at least one thing I have been putting off “until I lose weight”. Thanks to Substantia Jones from adipositivity.com for letting me use the photo above! This entry was posted in Fat Rights by fatbodypolitics. Bookmark the permalink. i ate whatever i wanted today!!! that included pasta and chocolate turtle desserts. I took a day off from the gym and have been lazy alllll day.. even took a nap!! not that I am on a “diet” but I have started to focus on eating healthier and have been feeling great!! nice article. rock on with your bad self! One of the most eye opening moments for me was to realise that to REALLY take care of my body, I had to stop hating it. I could not treat it well while I was loathing it for being fat. That’s a really important place to come to. Pingback: Int’l No Diet Day was May 6th « I AM in shape. ROUND is a shape.